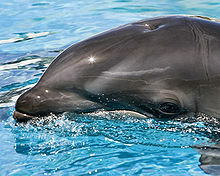 The senior official associated with the annual and notorious dolphin hunt in Japan assured U.S. Ambassador to Japan Caroline Kennedy that the harpooning of the cetaceans in entirely painless. Yoshifumi Kai of the Taiji Fishermen’s Cooperative wants to correct the odd impression that the dolphins writhing in the blood infused slaughter are actually experiencing pain when a giant spear-like weapon is thrust through their bodies. If so, we may have a solution for the shortage of lethal drugs for executions: we could just harpoon death row inmates. 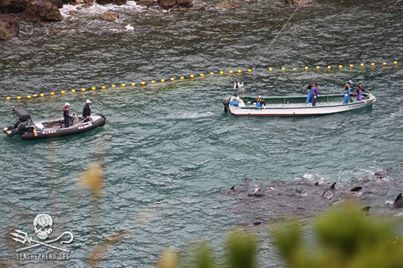 Indeed, in euthanasia countries like the Netherlands could switch over to harpooning for the terminally ill.
Apparentley the Japanese arent the only barbaric people who slaughter pods of cetaceans. People in the Faroe Islands kill pilot whales. I would comment somewhere else on your blog if I thought you would see my remarks. Kinda desperate. I have information about corrupt judges and lawyers and no where to turn. No lawyer has expressed a willingness to examine the material I have which substantiates my claims. What can I do? I understand the rules of conduct governing the behavior of judges and lawyers requires lawyers to take certain actions when they become aware of reliable evidence of serious violations. Talk about biting the hand that feeds you. It is a conflict of interest that blocks the process from functioning. It permits corruption to fester and grow unchecked. The debacle in Luzerne County was a warning. The work done to evaluate what went wrong, to suggest improvements and to hold professionals accountable merely left the old system in place. The qualifying behavior of judges is defined and it is rigorous. When ignored, you are warned that the very foundation of our democracy is undermined. Can you refer me to a lawyer in the Third Circuit who places personal and professional integrity above pandering to federal judges?